Despite what most people think in the upper Midwest, it will get warm soon, and that mans one thing: Patio Season. 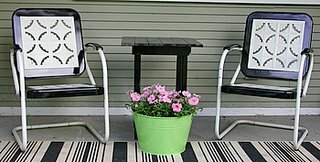 I am so excited to enjoy drinks and meals outside and look forward to someday having a patio of my own. 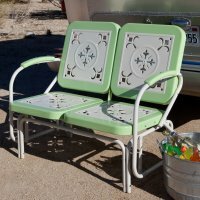 Per usual, I will decorate it with bright colors and retro, vintage furniture. 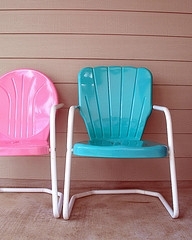 As one of my good friends would say, I covet these metal chairs. I covet them, too – do you know where they’re available, or are those restored originals?